Let me introduce you to our new Fleur De Lis Café Staff. 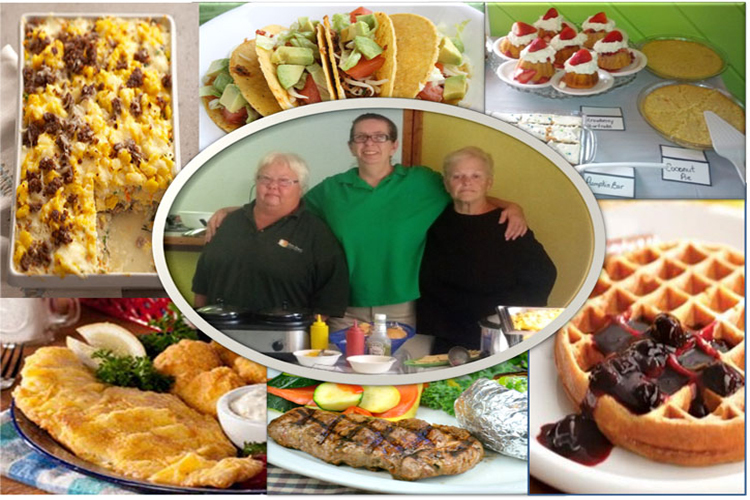 Head cook, Earline Smith, has over 40 years experience cooking great southern food for families like yours in Louisiana. Volunteers, Lisa “Boo Boo” Coulter and Carole Nicole, have a combined experience of over 50 years of cooking and taking care of people just like you for breakfast, lunch, and dinner. They have been hard at work lately with our weekly Friday Lunch specials ranging from All You Can Eat Tacos for only $5 to our freshly fried Louisiana Catfish with all the fixings for just $6.99. We also have our legendary Saturday Steak Night each week for only $11.95. Then to top it all off they get in early and stay late to give us the huge Sunday Brunch every week from 10:00am-1:00pm for the great low price of $6.99(adults) $3.99(kids). How could you not want to let us cook for prices like that? Don’t forget to stop in at our awesome Tiki Bar and order yourself a big, juicy homemade hamburger teamed up with regular or sweet potato fries! I sure miss you all!